The PathFinder is a word puzzle. It's a little bit like a wordsearch but with a really nice twist! 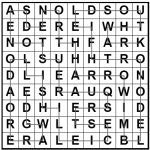 Each PathFinder puzzle gives you a grid, and inside that grid every single letter belongs to a word. The list of words are usually themed on a particular topic. What you need to do is work out the complete path from the start to the end of the puzzle. All the words are linked together in the pathfinder, so the last letter of one word is the first letter of the next word and so on. The PathFinder wiggles through every letter on the puzzle, and never uses each letter more than once - therefore it never crosses over. At each stage you must work out whether the path continues up, down, left or right. Some path finder puzzles will tell you the words that you need to find or the starting location, whilst others will leave it all up to you to make it harder. Our sample PathFinder contains nine London tube stations in the grid. To make it harder we've not told you which they are or where to start! If you're unfamiliar with the London Underground, then it will help to bring up a tube map through your preferred search engine. Good luck - we've also provided on the solution on the second page in case you get stuck or to check your solution. Be careful - there are a couple of tempting dead-ends you'll need to avoid as you work out the correct route through the puzzle! Our PathFinder topics are available on a range of themes and topics and can come with or without the word list displayed. Puzzles in high quality PDF format or EPS if preferred.